Creating the relationship you always wanted! These ebooks are available for immediate download to your computer in PDF document format. When the short checkout process is completed you will receive an email containing a link to your products which you are then free to access. Secure payment is taken via PayPal, we accept all Credit / Debit Cards. A PayPal account is not required. The whole process should take less than five minutes to complete. When the simple checkout procedure is completed you will be able to save the files to your hard disk. An email with a link to your purchases will also be sent to the address you supply. See below for more information about the products. For those of you who would prefer a printed version of these books please scroll down to the bottom of the page. Sometimes it is hard to overcome problems with equines, not impossible, just very hard. Whatever your chosen method of horsemanship these principles will help you to improve your skills as a horseman, solve problem behaviours and improve your relationships with horses, donkeys and mules. 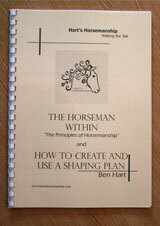 The book contains sixteen core principles that allow you to reach your potential as a horseman. 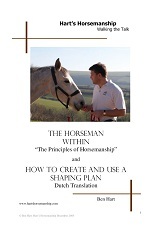 This book is not about being a horse trainer it is about becoming a horseman. 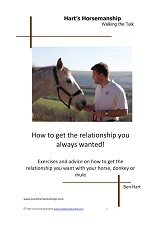 If you love horses, donkeys and mules then the Horseman Within will be instrumental in helping you to reach a balanced, effective and honest relationship with your equine companions. By increasing your understanding of how your own behaviour and beliefs affect your horse you will enhance your ability as a horseman. These principles allow you to follow your own path and reach your own destiny. Every chapter contains five steps to help you to fully develop each principle. This is not ABC of horse training, but rather a guide to helping your equines by increasing your skills and awareness of the principles of Horsemanship. These principles will increase your ability to shape behaviour, use positive reinforcement and improve your communication. Your patience will increase and you will learn to trust yourself and listen to your intuition. These principles will help you to think with an equine brain and thereby understand your horse's world. Most importantly you will be able top enjoy your journey to horsemanship. Whatever your association with horses, whether you have an equine behaviour problem to overcome or if you just want to learn more and understand your horse better these 63 pages will improve the relationship you have with your horse forever. If you have ever wanted to understand your horse's behaviour more fully and improve your ability to communicate with your horse, the Horseman Within is for you. The Elements of Horsemanship will help you to develop the relationship with your horse that you always wanted. Unlike other training books The Elements of Horsemanship recognises the unique nature of both you and your horse, therefore it will not tell what to do and how you should behave with your horse. You are both unique individuals who need to learn understand each other. The Elements of Horsemanship achieves this by asking you to consider the 50 elements involved in your relationship with your horse. You cannot make a horse respect you, but you can only be the sort of person your horse will respect. You will learn not what to think but rather how to think. Whatever your method of training the Elements of Horsemanship will develop your equine relationship beyond recognition. This is a true example of learning how to think not what to think and it will benefit every equine relationship you ever have. Elements such as Balance, Communication, Confidence, Courage, Dominance, Harmony, Fun, Leadership, Self Doubt, Truth, Power, Partnership & Vulnerability encourage you to develop your own path to horsemanship and to develop your own relationship with each equine you meet. Understanding these Elements will improve your understanding of equine behaviour. As you explore the Elements of Horsemanship you will learn to be more understanding, more patient and more accepting and you will become someone your horse wants to be with. By choosing an element you can examine your own beliefs and understand your own motivations. Each element offers a small task that will help develop your understanding of the element and its affect on your ability to communicate with your horse. The journey to enjoying a better relationship with horses starts with discovering yourself. These 50 elements are the beginning of finding the horseman that is within us all. The Elements of Horsemanship provides a daily support for the lessons learnt in the Horseman Within. Shaping behaviour is probably the single most important skill any equine owner can master. If you want to improve your horse's performance, remove problem behaviours or train a new one, being able to shape behaviour will transform your skill as a trainer, whatever method of training you use. Two of the greatest problems horse owners encounter, is not knowing what to do next with their horse and by rushing their training, missing out vital elements of behaviour. By using a shaping plan both of these problems can be safely and quickly removed. Shaping allows any problem behaviour, fear or phobia to be tackled safely and consistently. The greatest difficulty with shaping is learning to do it correctly. Most owners already accidentally shape behaviour to some degree, many of us just do not realise they are shaping. By understanding shaping and developing our ability to do it well, we transform our ability to communicate with our equines. Shaping is a vital skill that we must master in order to reach our full potential as a trainer. These 15 pages will help you learn how to write an effective shaping plan for any training situation or behaviour by creating the right goal and by understanding where to start. You will learn how to use the plan during training and how to start each session safely as well as how to progress from step to step. Study an example of a shaping plan for loading and use the blank shaping plan sheets to start creating your own shaping plans. The ability to shape behaviour well is the key to good, consistent communication with our equines. Once we know how to shape behaviour training becomes easier and safer. Exercises and advice on how to get the connection you want with your horse, donkey or mule. This e-book takes a look at the way we build our equine relationships and what affects those relationships. By better understanding the connection between ourselves and our equines we can focus on creating the relationship we have always dreamed of. This pack contains exercises for assessment of our current situation and helps us to decide what we really want. Then practical exercises to help us enjoy our equines more and a plan that builds trust and confidence in each other. Whether you have a new horse, or a long term relationship you want to improve, this pack gives simple, safe, effective exercises that can help you remove any blocks that may be holding you back and gives you steps to develop the relationship you want. If you are having problems with the horse, donkey or mule in your life then working on your relationship first will create a strong safe, ethical foundation that will allow you to remove barriers to enjoyment, while allowing you to follow your own path to horsemanship. The Starting Point - Exercise 1 Where am I now. Exercise 3 - What do I really, really want! Exercise 4 - What would I see? What about if you have some specific issues with your relationship? Shaping plans are detailed training plans which break down complicated behaviour in to small safe, ethical steps that are easy for the horse, donkey or mule to understand and achieve. The plan builds together to allow you to work with consistency, clarity and safety. No matter your chosen method of training, shaping plans will work for you and your equine as they fit any method of training by breaking down the required behaviour to small manageable steps which you can achieve using your chosen method. Shaping plans are the foundation of safe, ethical sustainable training that let you enjoy the learning journey with your equine. Most owners and trainers find that by using a shaping plan they lose the stress of training and regain the pleasure of working together. Shaping for confidence, trust and problem solving; we want calm relaxed equines, who trust us, both for their sake and our safety, but also so we can rid ourselves of worry and fear and enjoy our equine partnerships to the full. Gaining trust, is rightly, the desire of so many equine owners; it leads to greater safety and a happier relationship. However, trust has to be earnt and this plan sets out in small safe steps to show you how you can create the trust you need for a safe happy equine, whether that be on the ground or in the saddle. This plan is the foundation work for any equine and if you are starting out on a new equine partnership, no matter the age or experience of the horse, donkey or mule, this plan will guide you carefully to the safe relaxed relationship you want. As well as a lack of trust napping, leading, spooky, nervous, leading problems, reluctance to load, bolting, reluctance to leave the herd, unpredictable behaviour and so many other problems can be traced back to a lack of confidence in both horse and human so this plan seeks to safely increase the confidence of the handler at the same time as the animal. Small safe managed steps that grow to create a horse and human partnership that is confident on the ground, or in the saddle. By working with obstacles in a way that allows the animal to learn how to solve problems with you rather than be forced to obey and working with the key principles of layering and generalisation means that this is the plan that is the gateway to new behaviour, safety and confidence for you both. Many problems with our equines can be stem from missing these three simple foundations. Generally we expect the work and training we do to create trust and confidence and we don't often think about teaching them to solve problems, yet often without a deliberate plan to create these traits our training results in the exact opposite nervous horses or ones that don't trust us. However, with a deliberate detailed plan to create these three traits we can expect to see our horses, donkeys and mules grow in the relaxed, confident trusting partners we want. Essential for youngsters from foals to four years and for every equine that has a problem picking up their feet or being trimmed by the farrier. For safety sake this is a plan for any equine that currently doesn’t load or hasn’t tried and for those that load with reluctance. Every equine needs to lead well so a plan for those that have not yet been taught to lead or those that are being re schooled due to problems these steps will create to confident leading. This plan takes training to new levels of confidence with touch acceptance, grooming, taking their temperature, dealing with having body handled including vulnerable areas, good prep for vet, essential for all horses. A plan for all equines to increase confidence and problem solving with noise, vehicles and movement. Vital in preparation for starting and riding out. A plan for foals, yearlings and nervous animals that have never been trained to be caught or those equines of any age that have developed a catching problem. A must for every equine that sees the vet, especially those that are fearful and a little nervous or those that have had bad experiences. For foals, yearlings and very nervous animals, due to no handling or poor handling that has caused the animal to be reluctant to be touched. To safely tie up any equine from foal upwards, even those that don’t like being tied. For general handling, competition horses, those likely to need hosing as a result of injury, those who get muddy in winter and those nervous of water. For any equine that is likely to be clipped either for work or as a result of illness, and for those how already don’t like being clipped. From yearlings to old stagers, long lining builds confidence and trust while getting the animal fit vital for obstacles, prep for riding out an essential skill for every horse. Whatever your chosen tack, the earlier the animal gets use to tack the quieter and safer it is to train later, safe steps for bridle and bit, bitless and the saddle from youngster to late starter. If you are planning to ride a youngster out on the road, in a new area, with a new horse, or if you have a horse that is nervous leaving the yard or you are, is fearful on the road or generally is uncomfortable on the road. If you want to lose a few pounds then maybe this step by step plan that focuses not on what you can eat but rather what you believe about your food and the your belief about your self. Gentle, safe, life changing. Perfect for young horses being ridden for the first time or those that are being re-backed or started after time off or problems. Building on the preparation of other shaping plans for tack, long reining and confidence building this shaping plan takes the horse through the steps to safely introducing the rider and progressing to riding out side the training area. 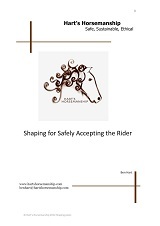 This collection of shaping plans is designed to help you to progress your horse either through the process of accepting the rider and riding on roads for the first time or to restart a horse that has had problems with riding or has been out of work for a long period of time. If you are sending your horse away to be ridden for the first time, by doing most of the training ourself, these plans will help them stay safe, succeed more easily and save you money on the time they are away. 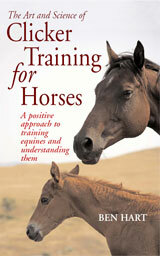 An illustrated guide to an exciting, effective and positive method of training equines. 1. Clicker training, what's all the fuss about? 2. What exactly is clicker training? 3. Where did clicker training come from? 4. What is the advantage of clicker training? 5. Is clicker training for equines just like clicker training dogs? 6. Doesn't using food rewards cause equines to bite? 7. Can anyone do it and with every equine? 8. Can I use clicker training in conjunction with my other training methods? 9. What is the difference between clicker training horses, donkeys and mules? 11. Do I have to use a clicker? 12. How do I start clicker training? 13. How do I use successive approximation? 14. Do I have to click for everything forever? 15. What can I teach with clicker training? 16. How to can I use clicker training to solve problems? 17. Can clicker training be used for emotional development of equines? 18. Can it be used in riding? 19. What else do I need to know about clicker training? 20. What is the future of clicker training? Sample from the first Chapter, Clicker Training, what's the fuss about? The Clicker has been portrayed by some horse trainers as a magic solution to every imaginable horse problem and excitingly the method has that potential. However, this claim of infallibility is the biggest danger to the success of clicker training as an equine training method. Clicker training is often sold as an easy, quick fix and positive method through which anyone and every equine can succeed. If only it were that simple, horses all over the world would have their lives transformed and many "behaviourists" would be happily out of business because there would be the wonderful situation of no more problem horses to "fix". If you would like a personal message in the cover of your new book, please include instructions during checkout. Pay through Pay Pal and be sure to leave you contact address for postage of your book. You can pay for this new printed combined version of The Horseman Within and How to Create and Use a Shaping Plan, by sending a cheque or postal order for £11.95 made payable to B. Hart to 5 Riverview Drive, Colyton, Devon EX24 6PR. Please ensure you enclose your address and contact details with your order and payment. I have spent time writing my thoughts and beliefs on some aspects of horsemanship in order to help more equines. These mini books are my beliefs on what it takes to improve the human relationship with equines. They are based on the balance of art and science and my observations and studies with my clients and many wonderful equine teachers. Instead of a just writing a book, I have chosen this format because I believe it is most in line with my beliefs and moral values as a trainer. I want people to choose what they need and when they want to buy it. I want people to be able to budget for the cost of information and I want people to find their own path, to do this each person needs to choose what they require to help them with where they are on their journey. I hope this way you are able to take what you need to learn with a minimum of financial investment but with the maximum potential gain. I would however urge anyone who wants to improve their relationship with their animals to read The Horseman Within. I believe who we are as a person is who we are as a trainer and that by examining ourselves we can better understand the emotional states of others. To get the best from my other ideas and writings I rely on the fact that the reader understands and has developed the principles contained in The Horseman Within. There is no magic, just learning, no ego, just honesty everyone can have a better understanding of their equine partner if they read and practise what they read. "There are many books, articles and manuals on the market to help us achieve just one goal that I believe every person who spends time with horses wants to reach. Being a good horseman or horsewoman by achieving the ultimate relationship with horses, being able to communicate so effectively with them that you have a partnership that seems impossible to see where the horse ends and the human begins. None of these resources look and the building blocks that truly create this kind of relationship and none of them ever ask you to look at yourself as a human being and as a horseman. Ben, you taken these building blocks and given them to your readers. Finally someone has taken a look at the foundation of horsemanship and shown us how to find the horseman within ourselves empowering us to follow our own paths to true horsemanship. It has taken me 2 years of personal comfort zone pushing and shaping my own behaviour to finally be able to get back in the saddle. It was this book and Ben's work, that has enabled me to get back on my horse. I have finally found the piece of me that I had lost a long time ago. I was then able to create a Shaping Plan to help my horse and I achieve our potential and enjoy life together again. 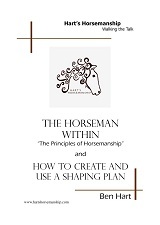 The Horseman Within makes you stop and think for yourself instead of following the 'leader', The Shaping Plan helps you to create a path to your goal and finally The Elements of Horsemanship then help to support your development at a much deeper level enabling you to really 'Find the Horseman Within'. Many other trainers out there get large followings for fantastic shows and demos and how quickly they can get a job done with a horse. Ben doesn't have that kind of ego he helps people have the confidence to be their own horseman with their own horse. Thank you Ben for your commitment to horse and humans, I could not have come this far this fast without you."